Brembo, the world leader and acknowledged innovator of brake technology introduced all-new M6 and M4 brake calipers at the Specialty Equipment Market Association (SEMA) Show (Booth #23561), held at the Las Vegas Convention Center. The race inspired Brembo M6 and M4 calipers are perfect for the club racer or weekend track day enthusiast that wants to take that next step in braking. The M6 is a six-piston aluminum front caliper with performance properties gleaned from the company’s endurance caliper that helped the Ford GT win the 24 Hours of Le Mans. The pistons include racing style radiators and dual inner piston seals, with an inner pressure seal and an outer wiper seal. This innovative design provides the best combination of performance and long-lasting track use. The calipers are hard anodized for longevity and resistance to corrosion at high temperatures. The Brembo logo is racing style, engraved in red, as seen on all of the company’s competition products. The new six-piston M6 calipers and four-piston M4 are derived from the current Brembo Gran Turismo (GT) performance caliper family. This makes the new components fully interchangeable with the GT kits, allowing them to fit under the same size wheels and accommodate the same size rotors while providing increased performance. In fact, the M6 and M4 calipers can be referenced through the same application list as the GT brake systems. The M6 is a front caliper designed for a disc that measures from 350 to 405mm, with a thickness of 32 to 34mm. The M4 is used for the rear axle as well as for some front applications and wraps around disc sizes from 328 to 380mm. The M6 and M4 share the same Brembo design characteristics that have been proven at the top rungs of motorsport for over 40 years. Brembo offers a comprehensive range of products dedicated exclusively to motorsports and designed to deliver the best results when used in the most extreme conditions: consistent performance, superior braking power, precision and control, and resistance to very high temperatures. All Brembo racing application products are the result of ongoing research and development in collaboration with the world’s most prestigious teams. All of these products are designed and manufactured in-house and track tested. The Brembo M6 and M4 will be available for purchase in 2017 from Race Technologies (www.racetechnologies.com), Brembo’s exclusive North American import distributor. 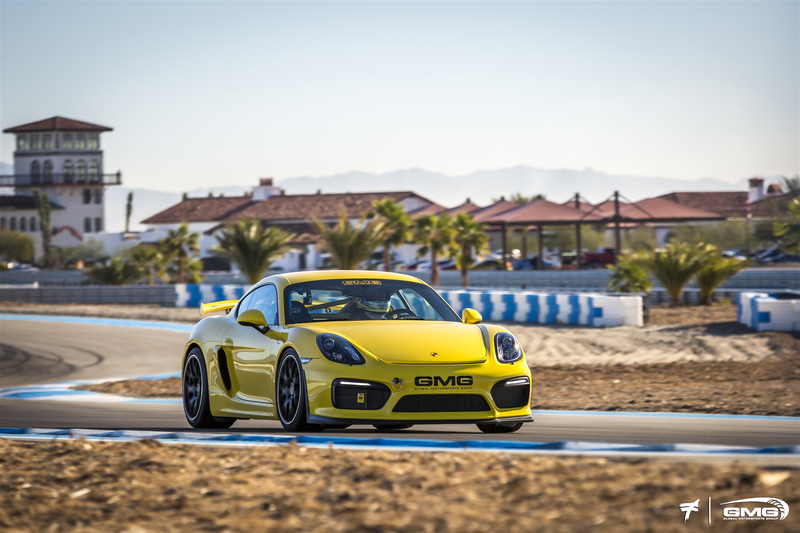 OFF THE SHOWROOM FLOOR AND STRAIGHT TO THE TRACK: The brand new Cayman GT4 (981) is Porsche’s lightweight platform specifically focused for the racetrack and track day enthusiasts. THE PORSCHE 911 (991) DNA: Since most of the front end, upright, and suspension components on the Porsche Cayman GT4 are from the Porsche 991 GT3 (911), the Brembo OE (Original Equipment) brakes equipped on the Porsche Cayman GT4 are some of the most sophisticated designed for an OE application. 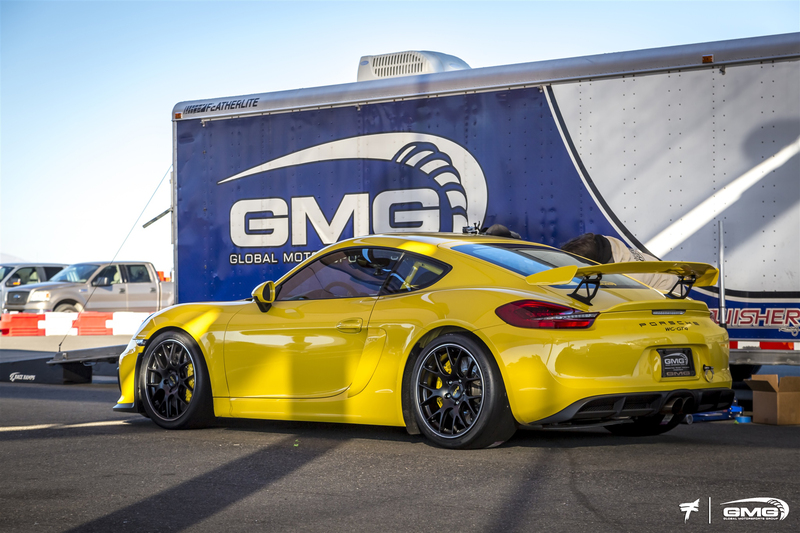 GMG Racing 981 Cayman GT4 Front end, upright and brake system. 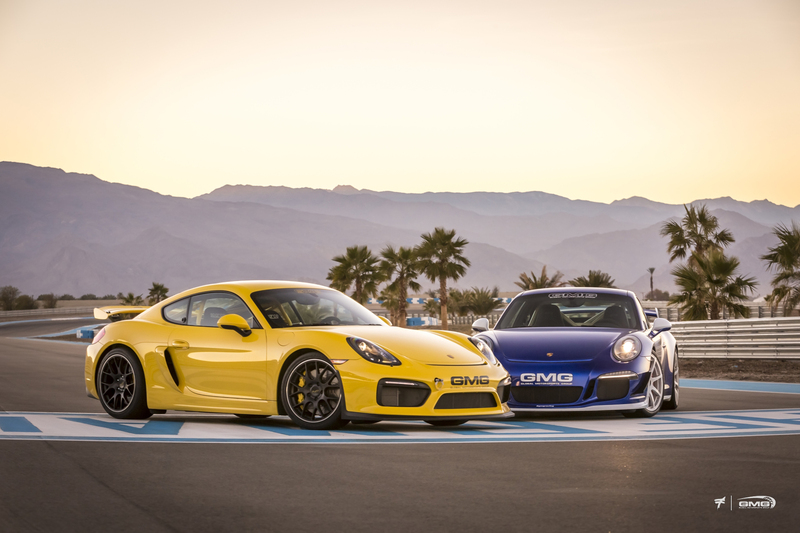 CAYMAN GT4 VS. 911 GT3: The Porsche Cayman GT4 Brembo OE brakes utilize 6-piston aluminum fixed monobloc calipers front and 4-piston aluminum fixed monobloc calipers in the rear. The Cayman GT4 uses heavy duty 380 x 34 mm ventilated front & 380 x 30 mm rear brake discs similar to what is equipped on a Porsche 991 GT3. 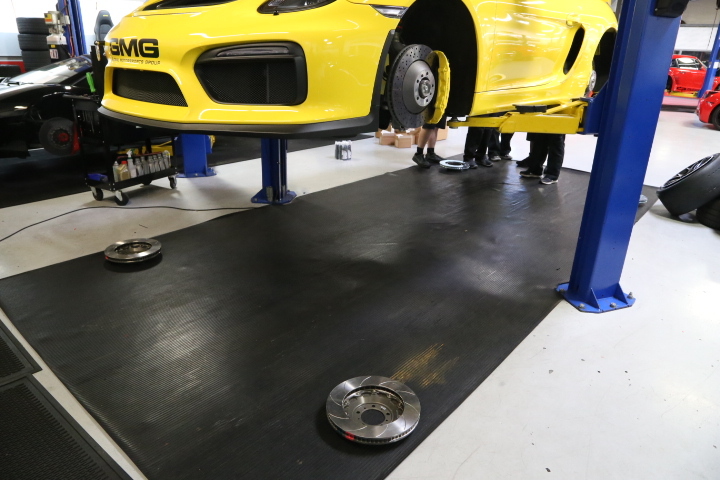 The Porsche Cayman GT4 brakes also uses a wide annulus (radial depth) front and rear pad for maximum swept area, heat dissipation, and pad life. The OE pads are also 18 mm thick front and rear which is comparable to most high performance aftermarket calipers. 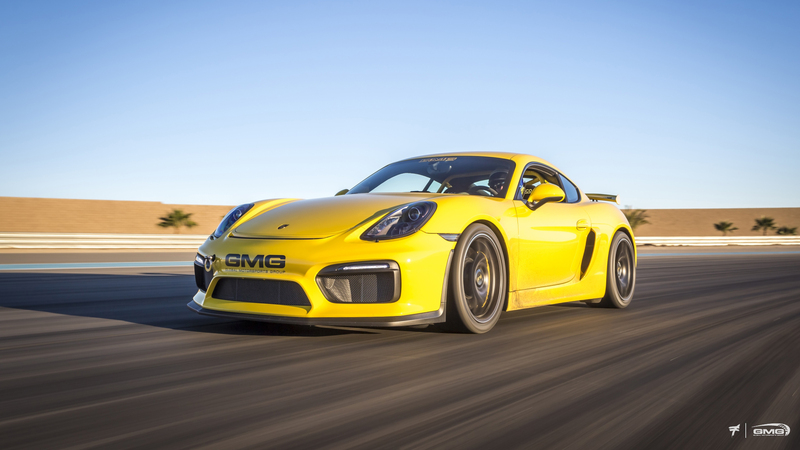 HOW THEY DIFFER FROM EACH OTHER: While the Porsche Cayman GT4 and 991 GT3 are similar on paper in many ways, there are some of major technical differences between the Porsche 991 GT3 and Cayman 981 GT4. These technical differences significantly affect overall brake balance setup and performance. The Porsche Cayman’s suspension setup (especially the rear), geometry, and dynamic weight distribution is fundamentally different resulting in an overall chassis balance that is more sensitive to braking inputs than a GT3. 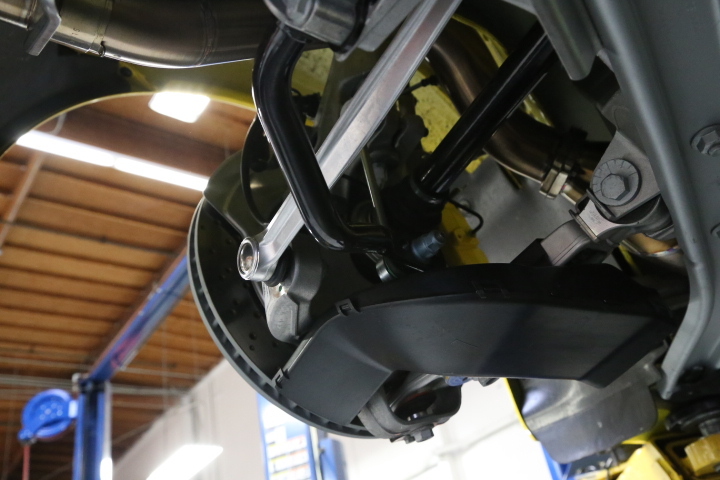 The Porsche Cayman GT4’s suspension geometry. The Cayman’s inherent tendency to pitch more under braking increases front axle brake demand, but inherently results in unsettling the rear axle under braking. 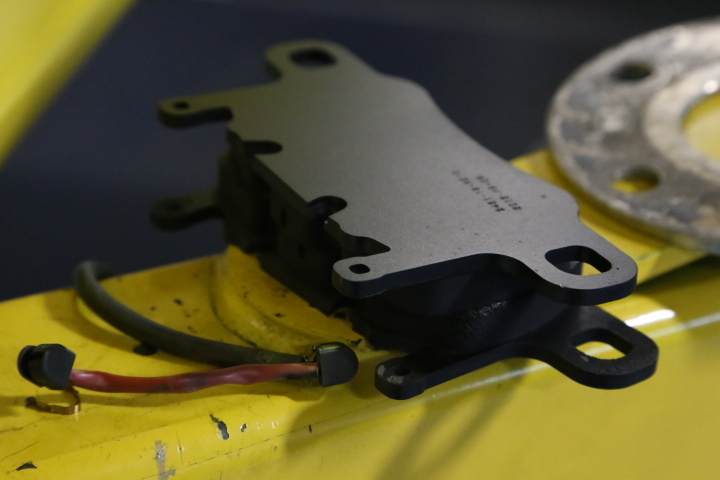 However, this can be tuned with managing the operating temperature of the brake disc and also by using different friction compounds that are optimized for the specific brake temperature windows. 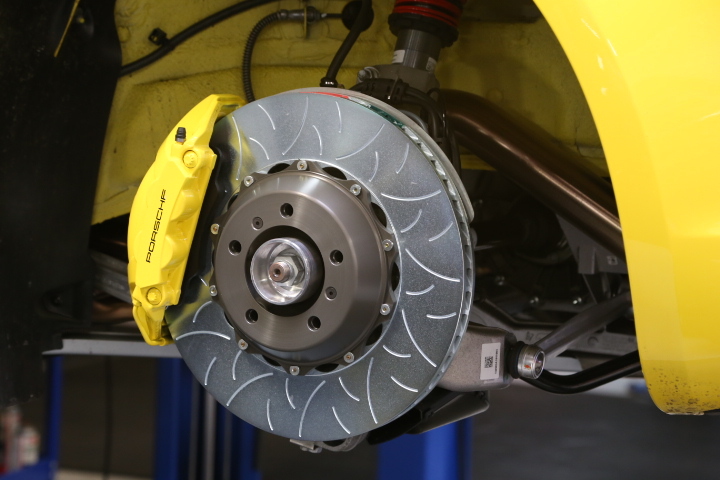 Brembo Performance Type 5 endurance discs used to maximize disc life on the track. BREMBO DISC OPTIONS: The front Brembo 380 x 34 / 72 Vane racing disc used for the GT4 application are available in multiple configurations (standard or heavy duty and Type 3 Sprint or Type 5 Endurance) to help the user setup the brakes to suit their demands. The Porsche’s Cayman GT4 is a true mid-engine platform with the engine sitting in front of the rear axle closer to the center of the chassis unlike the 991 GT3 which is a rear-engine platform with the engine sitting over the rear axle. MID-ENGINE VS. REAR-ENGINE: A mid-engine platform will generally demand less out of the rear brakes compared to a rear-engine platform with all the weight sitting on the rear axle. The Cayman’s mid-engine design also inherently results in the rear axle getting unsettled easier under braking inputs. 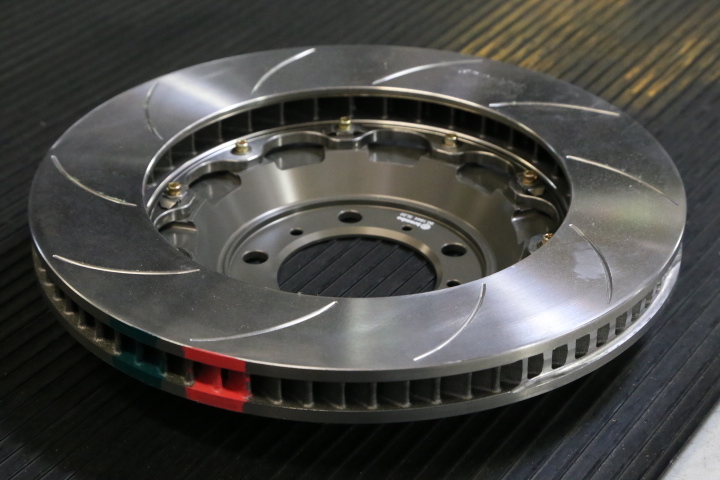 STABLE DISC TEMPERATURES: The rear Brembo 380 x 30 Type 3 racing disc, used for the GT4 application is offered in a 48 vane configuration. This 48 vane disc configuration stores more heat in the disc, which allows for more stable rear brake temperatures, resulting in improved disc life for the intended use. The Porsche Cayman GT4 generally weighs 200 lbs less than a 991 GT3 (Cayman GT4 Curb Weight – 2955 lbs, 991 GT3 Curb Weight – 3150 lbs). Overall weight and weight balance directly influence a vehicle’s brake demand. The Cayman GT4 with less overall weight (especially over the rear axle) will also demand significantly less out of the rear brakes compared to a 991 GT3. 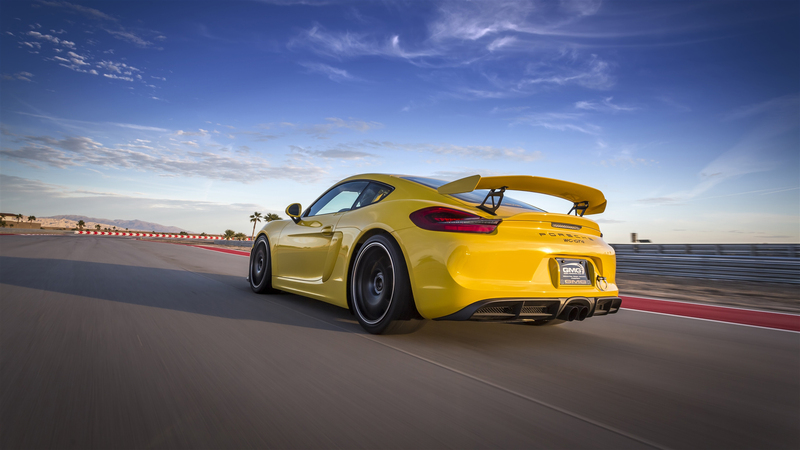 The Porsche Cayman GT4’s bumper design and aerodynamics are different and more adjustable than a 991 GT3. The Cayman GT4 features an adjustable front diffuser and rear wing to increase downforce and grip versus the non-adjustable parts on the 991 GT3. 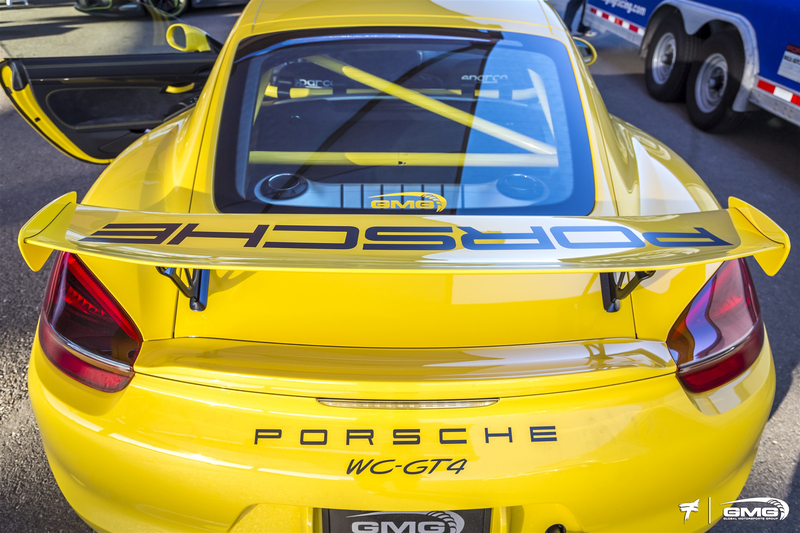 The Porsche Cayman GT4 has an adjustable Rear wing to add rear downforce. Bumper design has a significant influence on airflow to the brake system which results in different braking demands on the front and rear axles. Increased downforce and grip also affects brake balance and demand depending on the exact chassis setup. IN CONCLUSION: There are certain limitations with the OE components on any high performance application as they are designed specifically for the car manufacturers to their requirements of comfort, wear rates in various road environments, cost and serviceability. 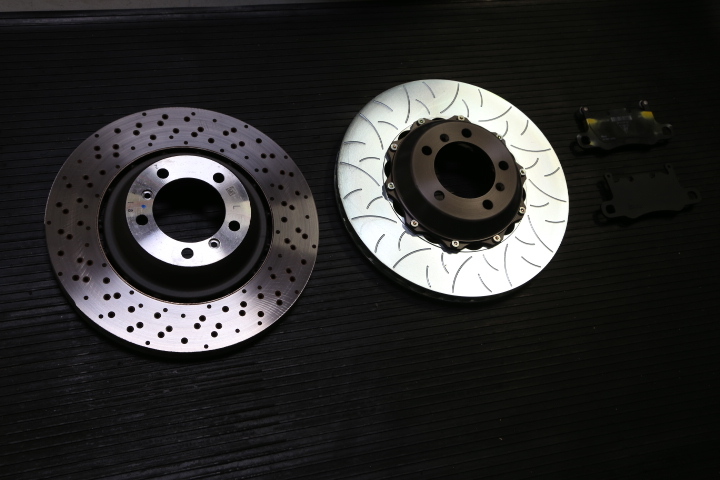 As the braking system’s primary function is to dissipate heat, Brembo uses purpose-designed discs in order to increase the fade resistance and thermal capacity of the system. These discs are directionally ventilated for enhanced cooling and slotted for better performance and continuously refreshing the pad surface. Brembo Performance 2-piece discs are made up of a proprietary advanced cast-iron alloy which offers an exceptional coefficient of friction and resistance to thermal shock and fatigue. 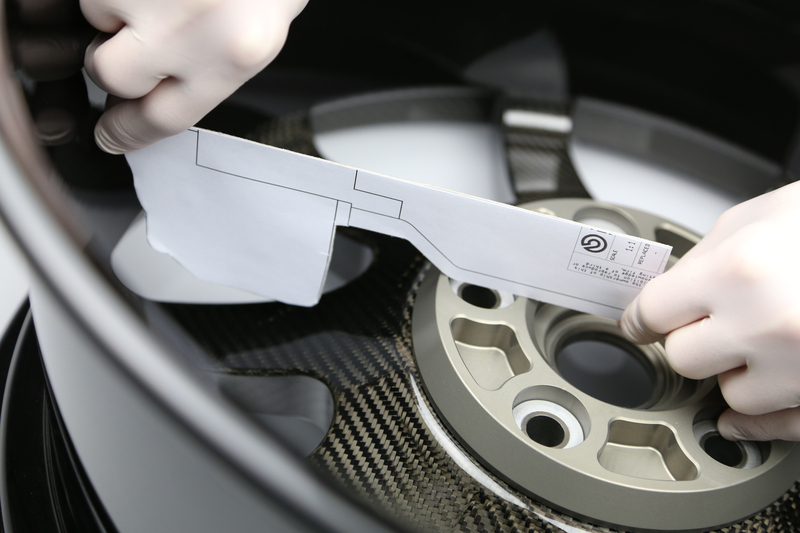 The same Brembo Racing discs trusted every weekend in professional motorsports are also utilized in the Brembo Performance Program (GT, GT-R & Race Systems). 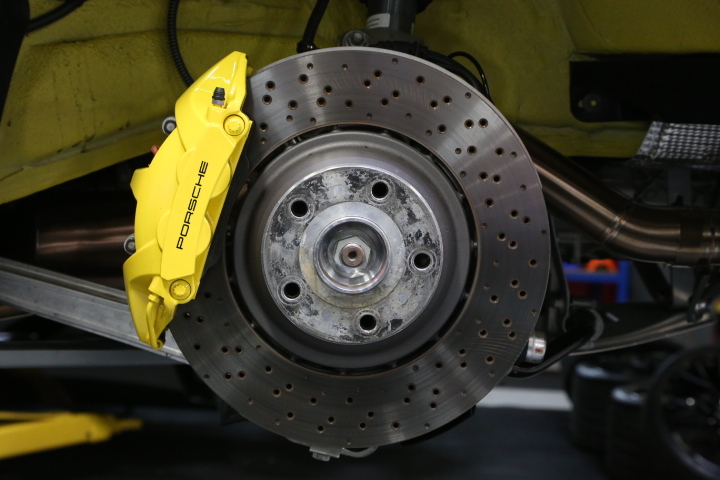 OEM INTEGRATION: Brembo 2-piece disc upgrades are designed to work seamlessly with the OE calipers and systems (manufactured by Brembo for Porsche). This guarantees the utmost in safety and seamless fitment. LIGHTWEIGHT: Disc assemblies include an outer iron disc with aluminum bell/hat and provide decreased corner weights to improve vehicle dynamics including handling, acceleration, and braking. TYPE III SLOT PATTERN: Extensively used in professional motorsports, the Type III slot pattern offers a high initial response with excellent release characteristics. HIGH THERMAL CAPACITY: Greatly improved thermal capacity and heat management over OE discs and other aftermarket discs in the market. This also improves braking performance and allows for greater longevity of the components. 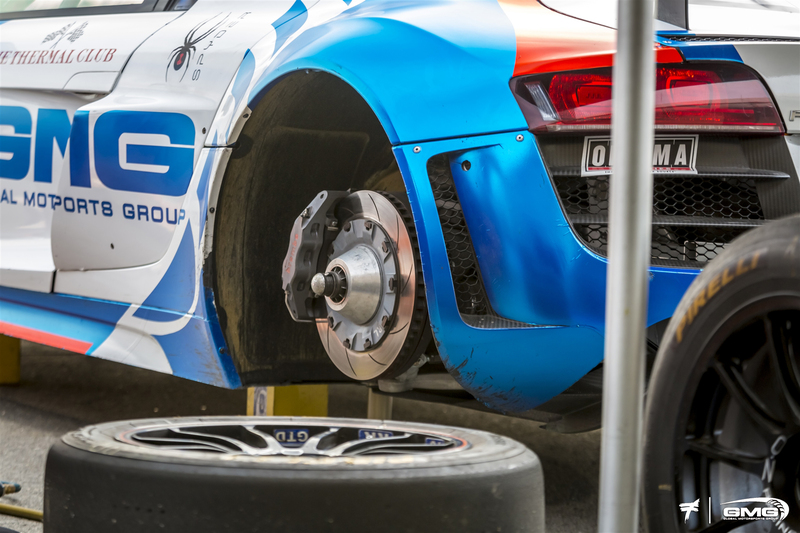 FRICTION MATERIALS: Everything we learn by supporting top professional racing teams throughout the world goes into selecting the best brake pad options for all levels of street, track and racing use. Complete Brembo disc hardware (D-type bobbin) w/ anti-rattle springs. (Full Floating Option Available Upon Request). – Type III or Type V “Endurance” slot type available. – 20 lbs – disc ring. LAS VEGAS, Nev., Nov. 3, 2015 – Brembo, the world leader and acknowledged innovator of brake technology introduces a brand new product during the 2015 Specialty Equipment Market Association (SEMA) Show (Booth #23561) on November 3-5, at the Las Vegas Convention Center. Brembo launches the B-M8, the all-new 8-piston caliper and its companion the B-M4. 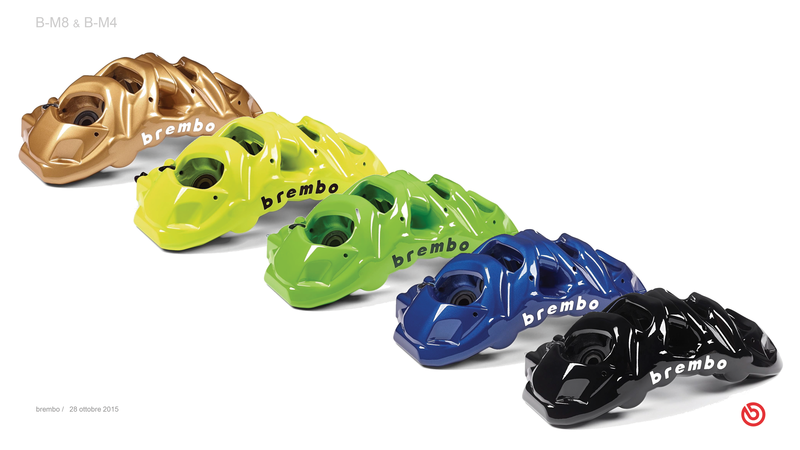 The Brembo B-M8 is an 8-piston monobloc caliper with four pads, suitable for rotors up to 420mm x 40mm (16.53” x 1.57”). This all-new caliper is specifically made for the front braking systems of trucks, SUVs and large high-performance sedans. 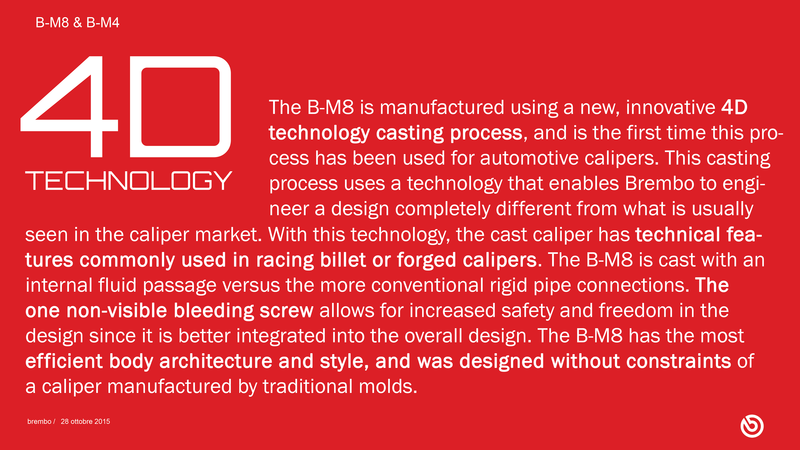 As one of the largest calipers manufactured by Brembo, at 15.8 inches x 5.51 inches x 7.1 inches, the B-M8 required more than one thousand design hours, which included on-vehicle testing and casting technology development. The B-M8 is validated for torques up to 5700Nm (4204 lb ft). The B-M8 is available in four colors – red, yellow, black and new to the market white, with a few “optional” colors. The companion caliper, the B-M4, for rotors up to 380mm x 30 mm, is 12.2” x 6,42” x 3.54” and suitable for the rear braking systems of larger vehicles as well as front applications for smaller cars. The B-M8 and B-M4 are ideal for a variety of domestic and import trucks, SUVs, and sedans including, but not limited to Ford F-Series and Expedition, Dodge Ram, Toyota Tundra, Nissan Frontier, Land Rover Range Rover, Mercedes-Benz SUVs and Porsche Cayenne. This new caliper aligns with Brembo’s principles of developing new and innovative products with a designed flair. The B-M8 will not only provide superior stopping performance, but will also deliver a design aesthetic that fills the large wheel openings of today’s 22-inch truck and car wheels. 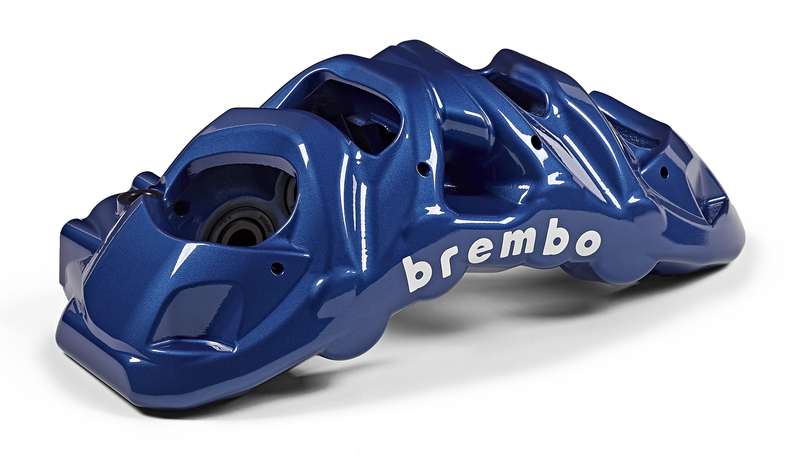 The company have taken its expertise in the motorsports world and applied it to large truck and SUV braking systems to create one of the largest and best looking calipers in the Brembo line. Developed to increase overall braking performance, the B-M8 exhibits consistent braking power under intensive conditions. 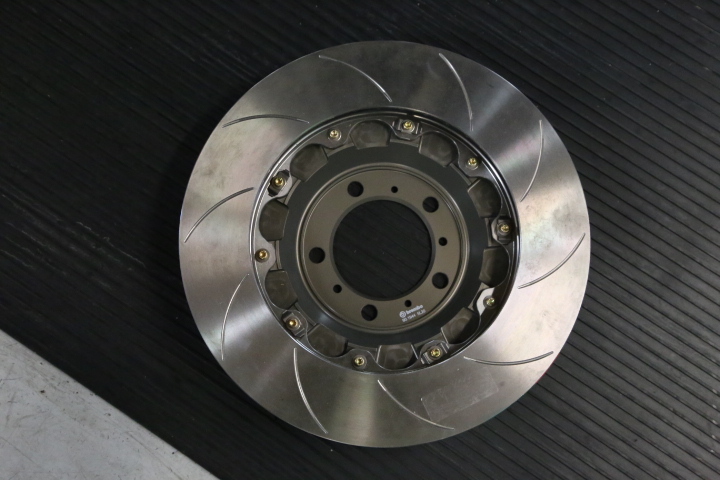 The B-M8’s four pads provide a significantly larger braking surface, improving performance and pad wear, while communicating increased “bite” to the driver. Manufactured in the same plant as the company’s racing brake systems, the B-M8 leverages Brembo’s 40 years in motorsports in an advanced road-going high performance caliper. B-M8 and B-M4 with their innovative and exclusive design are the first members of a NEW FAMILY of calipers that will distinguish the new High Performance Brembo Kits from others in the market, moving the car where it will be fitted to a new and clear identity. The Brembo B-M8 and B-M4 will be available for purchase in 2016 from Race Technologies. 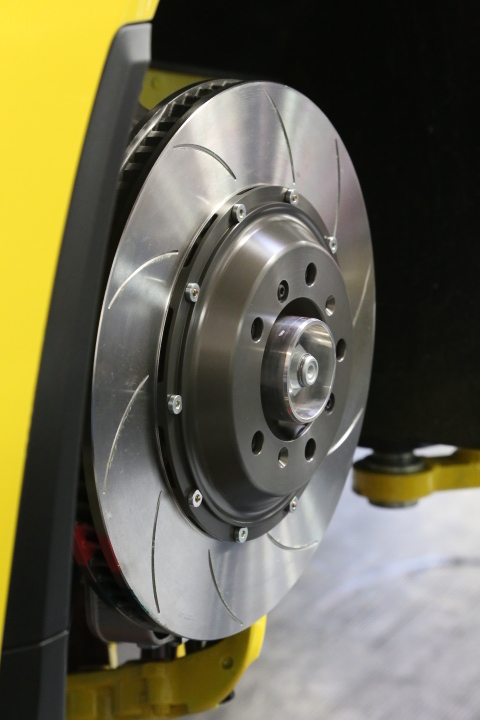 Brembo SpA is the world leader and acknowledged innovator of disc brake technology for automotive vehicles. 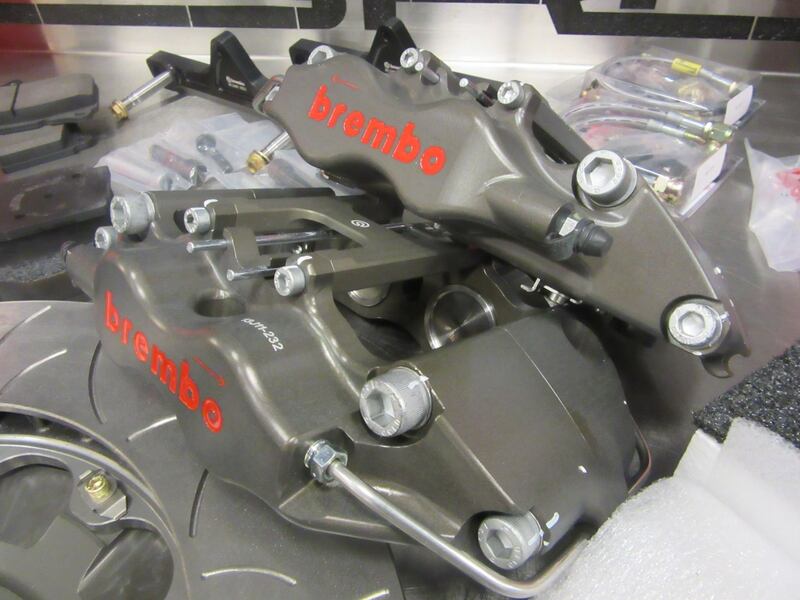 Brembo supplies high performance brake systems for the most important manufacturers of cars, commercial vehicles and motorbikes worldwide, as well as clutches and other components for racing. Brembo is also a leader in the racing sector and has won more than 300 championships. Today the company operates in 16 countries on 3 continents, with 24 production and business sites, and a pool of around 7.700 employees, about 10% of whom are engineers and product specialists active in the R&D. 2014 turnover is € 1,803.3 million (12/31/2014). 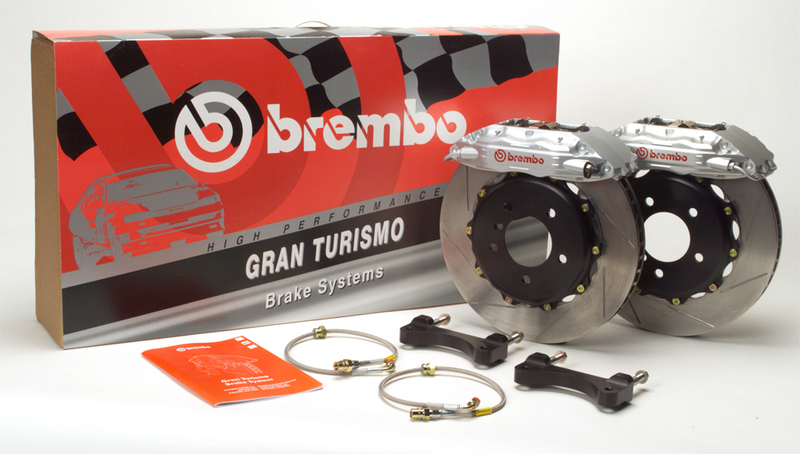 Brembo is the owner of the Brembo, Breco, AP, Bybre and Marchesini, and operates through the AP Racing brand. 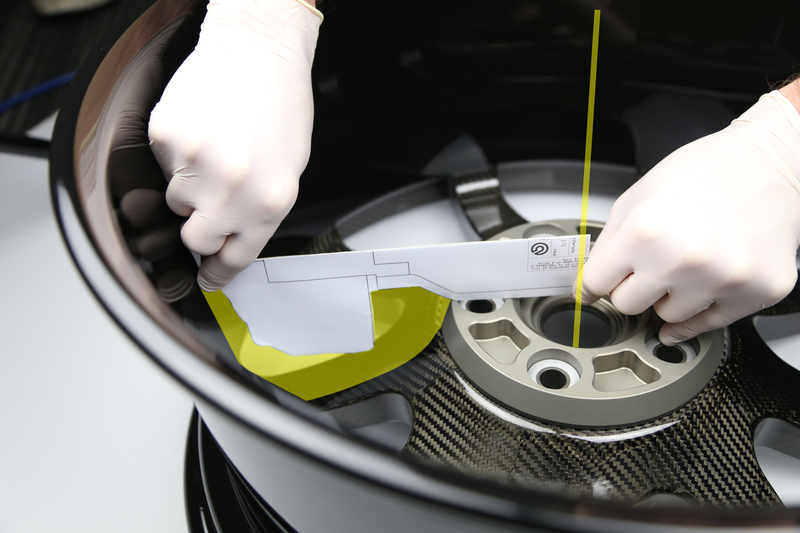 For more information, visit us at http://www.brembo.com. To access the 2015 Brembo SEMA media kit, visit www.mediakit.brembo.com. In the mid 1990’s, company founder, Jaime Trimble was deeply involved in the Porsche community; buying, selling, and building Porsche 911’s and 930’s. 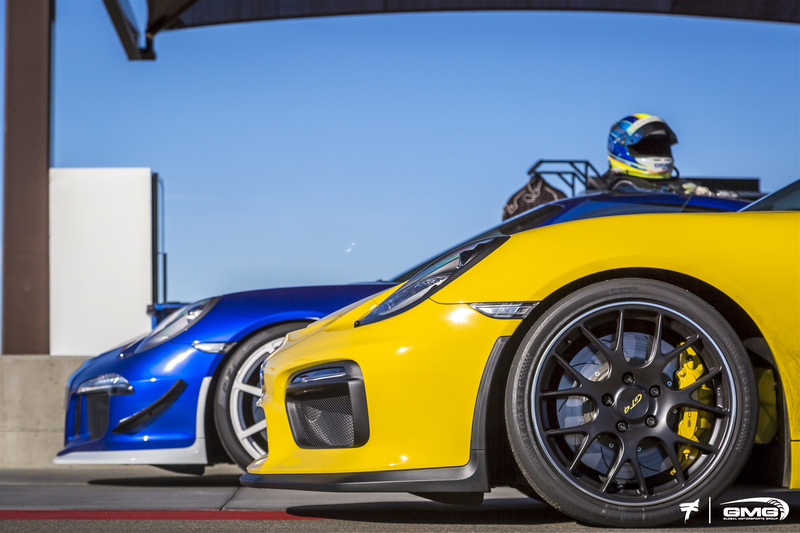 His passion led him to start a business offering a line of performance upgrades for Porsche. 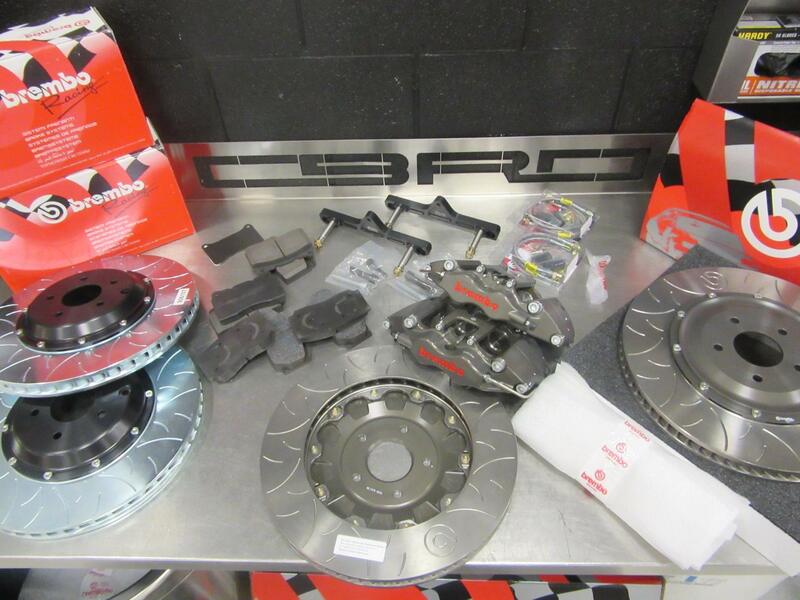 As part of the company’s product line, he began producing “Big Brake Kits” by retrofitting Porsche OE Brembo calipers and discs to early model Porsches. These early brake kits proved to be very successful in the market due to the way they were designed and packaged for ease of installation. However, Jaime recognized that retrofitting OE components from one vehicle to another had its disadvantages and limitations so he began looking for better solutions. The working partnership between Race Technologies and Brembo resulted in the “Big Brake System” which was engineered by Brembo to be application specific. 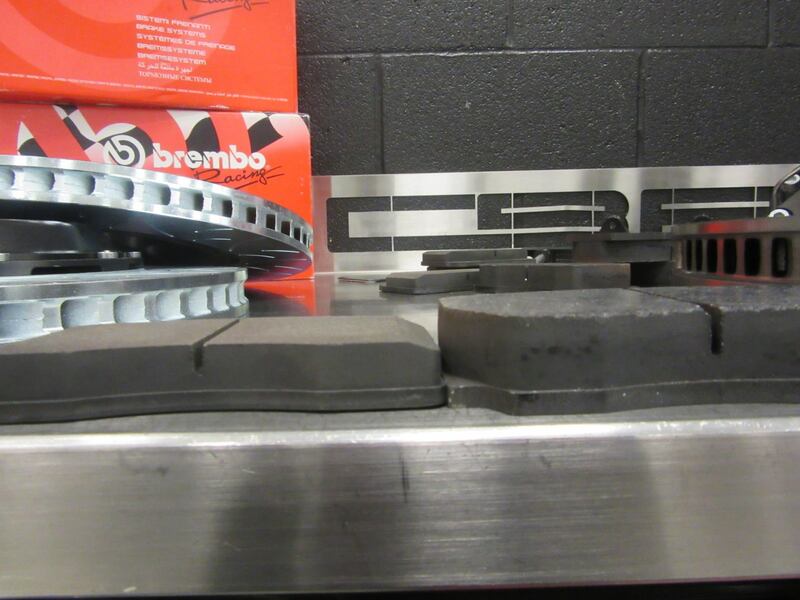 In 1998, Jaime met with Brembo North America to discuss how they could cooperate on developing a new line of aftermarket performance brake upgrades. These upgrades would be the first of their kind and engineered as “systems” utilizing purpose designed components to integrate seamlessly to a vehicle. This initial endeavor eventually became part of a global effort lead by Brembo Italy that established an official Brembo High Performance Program. As a result Jaime formed a new company, Race Technologies, that signed on as the first High Performance Master Distributor and later became the exclusive U.S. Commercial Partner in 2004. 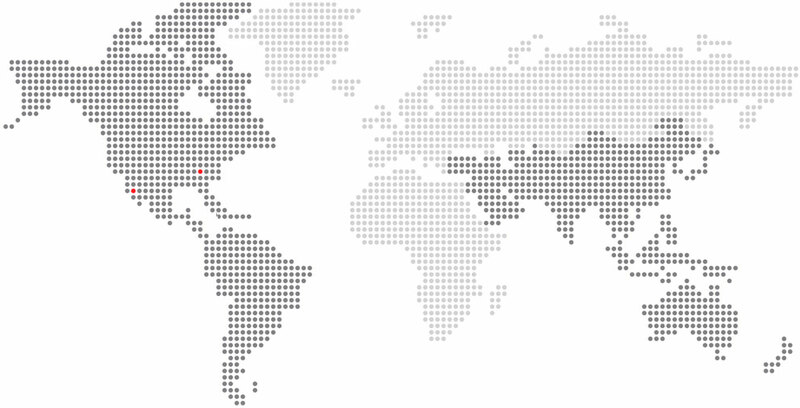 In 2008, Brembo moved their headquarters from California to Plymouth, MI to support the OE’s and their U.S. operations. Race Technologies then assumed the primary responsibility of the California facility and became the sole U.S. Importer for Brembo High Performance. The new structure proved to be highly effective by directly aligning the sales and logistics efforts of Race Technologies with the manufacturing and production process in Brembo Italy. Here’s a video of Jaime Trimble going over the Brembo Performance program on the GT Channel (November 15th, 2011). In 2012, Brembo and Race Technologies began working together to support the rapidly growing needs of the Far East (Asia) market. As part of this effort, Race Technologies began working closely with and supplying the Official High Performance Importers, Dealers, and Distributors in the region. The results of the collaboration shortened product lead times, increased protection of Brembo’s brand integrity, and reduced the presence of grey market products. 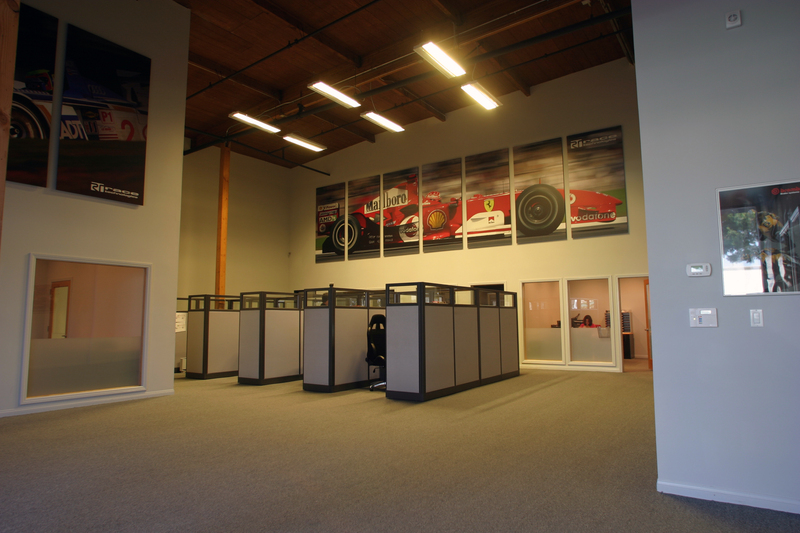 Race Technologies provides market development, supply chain management and technical product support. Through our strategic partnership with Brembo and Sabelt, we support an international network of Official Dealers and Distributors that serve the automotive performance and racing community. In 2013, Race Technologies became the official importer for Brembo Racing and Sabelt (Brembo Group 2008-2015). As the world’s leading braking supplier in professional motorsports, Brembo recognized the growing overlap between amateur, club, and professional racing in the U.S. In an effort to better serve these market segments, Brembo directly aligned their High Performance and Racing programs. The new structure expanded service and support to all segments of the racing market. The Race Technologies facility in Moorseville, North Carolina which supports Brembo U.S. Racing Operations. 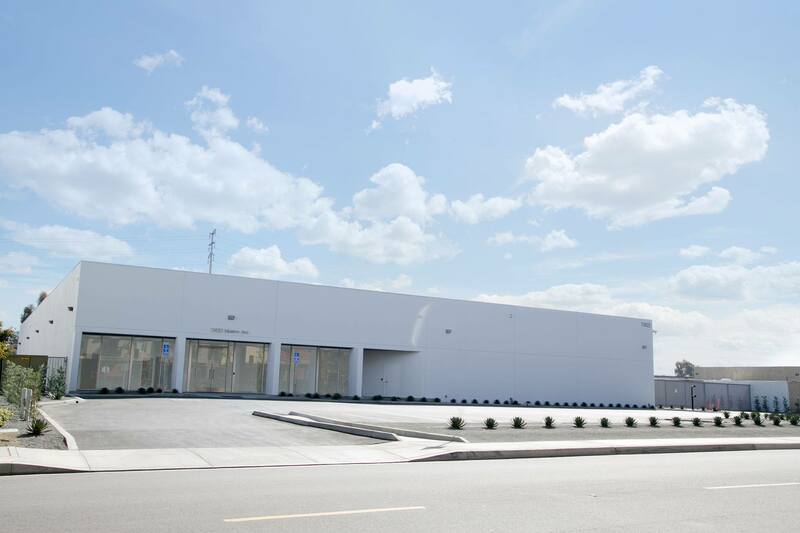 In late 2013 and early 2014, Race Technologies established two new facilities to support the future growth of the Brembo High Performance, Racing, and Sabelt programs. The first was a newly designed 30,000 sq. ft. facility located in Irvine, California to serve as a hub and U.S. headquarters. The second, located in Mooresville, North Carolina was to support all of the U.S Racing programs. Both facilities are shared by Race Technologies and Brembo staff including on-site engineers and program managers for each market segment. The newly designed 30,000 sq. ft. Race Technologies facility located in Irvine, California to serve as a hub and U.S. headquarters. Today, Race Technologies is a team of dedicated professionals that represent the Brembo and Sabelt brands and proudly serve an international network of official dealers and distributors. With all of the success and growth of the company over the past 15 years, “What we do” has certainly changed, but one thing that has not is “Who we are”. We remain true to our enthusiast roots and recognize that our customers are why we are here and we must always strive to “Be The Solution”. Race Technologies provides market development, supply chain management, and technical product support. Through our strategic partnership with Brembo, we support an international network of Official Dealers and Distributors that serve the automotive performance and racing community. Before you buy, regardless of wheel size, you must confirm brake system to wheel clearance before purchasing a Brembo Performance system. 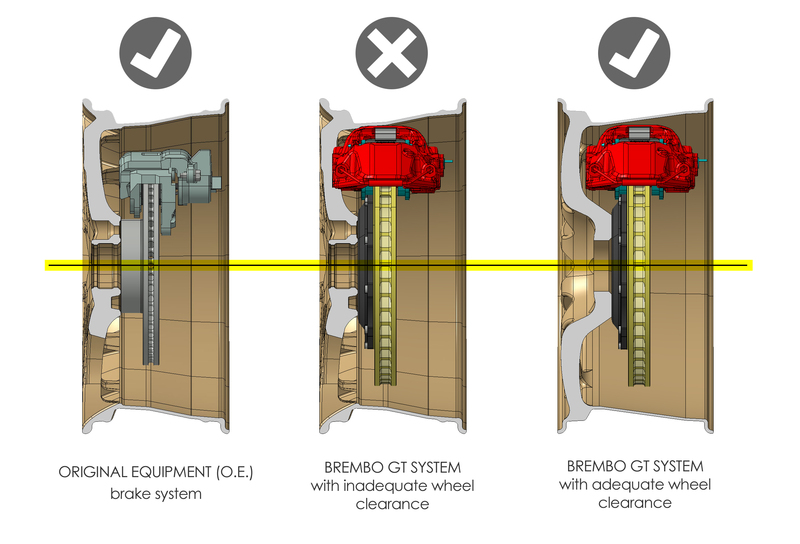 These CAD drawings represent the clearance of an Original Equipment (left) brake system compared to a GT system with inadequate clearance (middle), and one with proper clearance (far right). Brembo Performance brake systems are always designed to maximize wheel fitment. However larger components are often required to meet performance parameters determined by Brembo engineers, so it may be necessary to utilize a wheel spacer or to upgrade to an aftermarket wheel with adequate clearance. There are a number of variables that can affect wheel clearance including wheel diameter, wheel offset, and wheel design. In order to determine if a wheel has adequate clearance, please follow the instructions below or download a printable copy of these instructions by clicking here. STEP 1: Look up your application (Year/Make/Model search) on www.racetechnologies.com. STEP 2: Select your brake system. STEP 3: Download or open the PDF document listed under Wheel Clearance information. 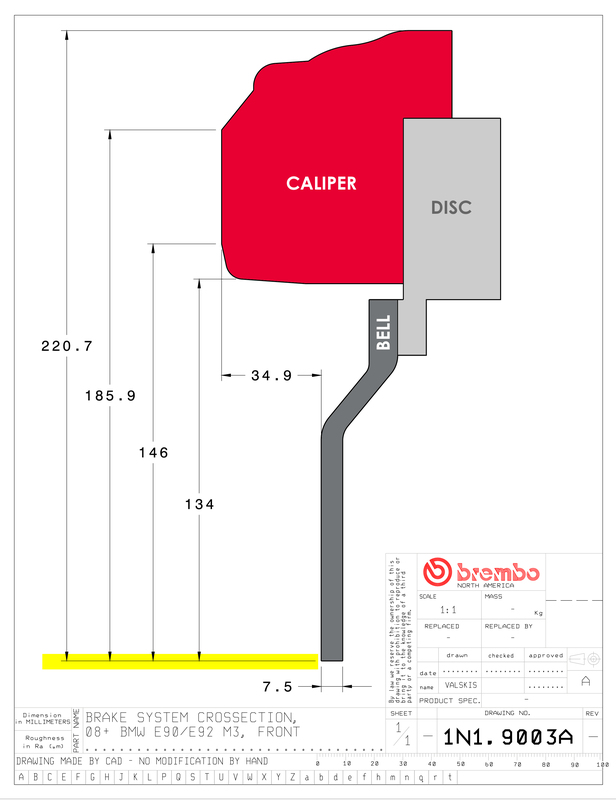 Note: All Brembo GT/GT-R systems have a specific corresponding wheel clearance diagram (brake profile cross section). STEP 4: Print out the document, but be sure to make sure you’re printing at full scale (1:1 or at 100% size). There’s a ruler on the bottom right-hand side of the page to compare it with. STEP 5: Cut out the shape of the template to include the caliper, bell, and disc. Optional: You may want to back the cut-out with a piece of cardboard or foam core to make sure that the template is sturdy enough to get a proper gauge of your wheel clearance. STEP 1: Remove a wheel. STEP 2: Place the wheel carefully on its face and measure out the A/B/C dimensions with a straight edge or create a template from the clearance diagram. STEP 3: If using a clearance diagram attached to tag board as a template, be sure to double check that the template retains the actual dimensions from the original diagram. 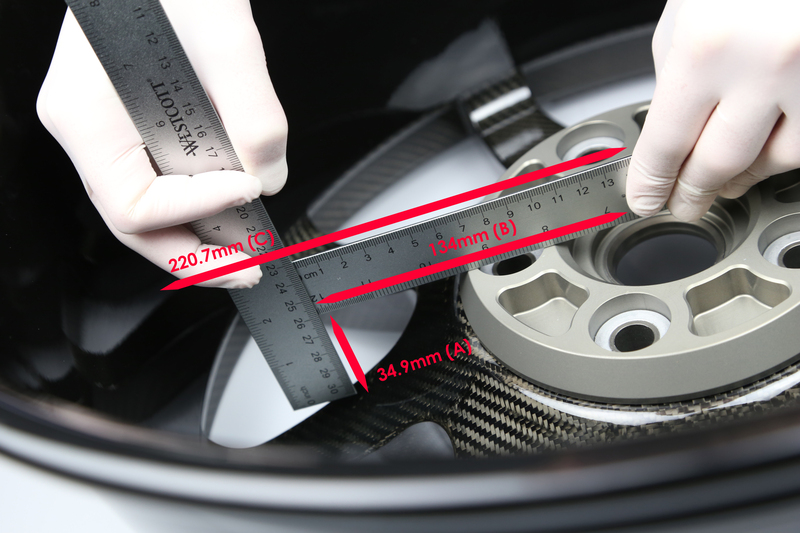 STEP 4: Allow 3mm in all directions from the caliper to the wheel. STEP 5: If the caliper contacts the inner wheel spokes, a wheel spacer may be used to move the wheel out away from the caliper. When using spacers, we recommend only considering high quality hubcentric spacers (and longer wheel bolts/lugs when needed). It is also important to confirm that the wider track will allow the tire to clear the fenders in all positions. We are using part #1n1.9003A (a 2013 BMW M3) for our example. The kit number is shown on the lower right, and all measurements are shown in millimeters. The diagrams are shown at full scale, but once they have been printed these measurements must be confirmed before use. We colored in the CAD drawing to help make it easier to understand the brake assembly cross section. The red area represents the rotated profile of the caliper, the dark grey colored area is the bell, and the silver area is the disc. In this example, the clearance diagram has the center of the wheel marked with a yellow highlighter. If you rotate the previous diagram and set it into the wheel, it would look like the diagram above that includes a wheel cut-away. That same yellow line is represented by the dashed line below. The drawing above is a cut-away of a GT system inside of a wheel on its face. 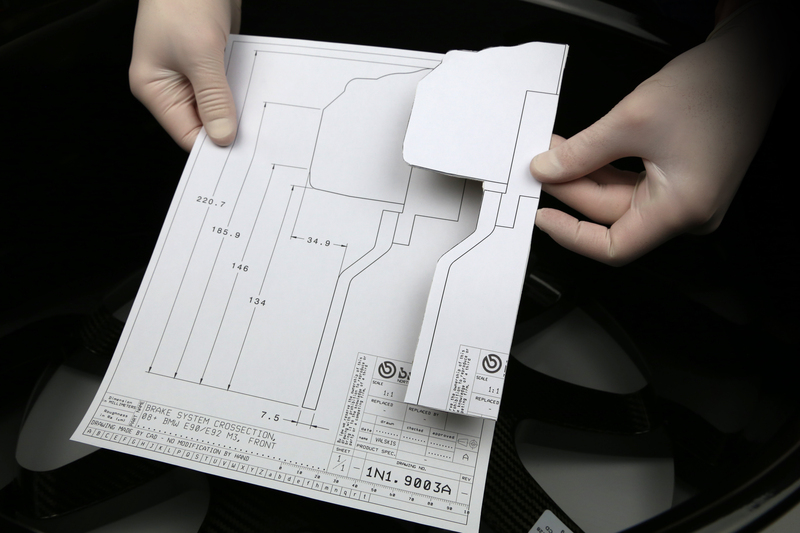 The diagrams are shown at full scale, but once they have been printed these measurements must be confirmed before use. Place the cut-out inside the wheel well. If the cut-out is too flimsy, you may need to adhere it to a piece of cardboard to help with getting a proper gauge on your brake to wheel clearance. Allow 3mm in all directions from the caliper to the wheel. Note: the imagery and highlighted areas is meant to be an approximation to help illustrate the tutorial. All Brembo Performance systems are custom packaged to order, so they cannot be returned due to wheel fitment which is why it’s very important to verify brake and wheel fitment before placing your order.